I made a quick bento for today. I put some soy sauce chicken chunks with sesame seeds on the top which is very quick to prepare. Just sliced the chicken thinly, put some sweet soy sauce, add some salt and white pepper ... quick and easy. Put some cherry tomatoes, carrots and fried potato. Cut the omelet into a rabbit shape and decorate the eyes and mouth with nori. Actually my kids had a school catering for today's lunch. But suddenly I got a call from school that one of their teachers just passed away this morning (our deep condolences to Ms. Ayu's family), so the school was dismissed earlier at 10.00am instead of 02.00pm as usual. We got home around 10.30 and my son asked me to make a small portion of bento before lunch time. 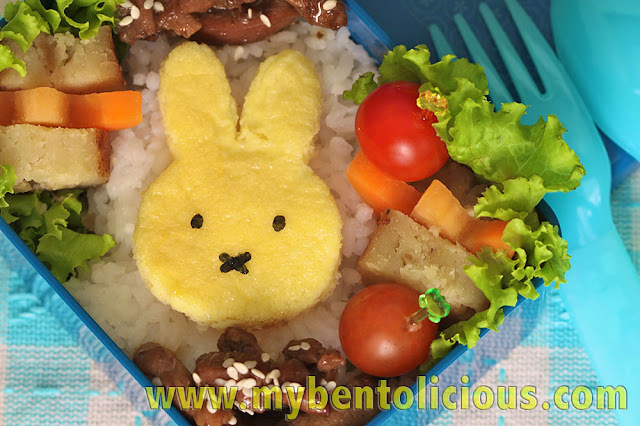 Nothing to do until lunch time, I then agreed to make him this quick bento.